Since I first started sewing, I've been trucking along on a Singer Confidence which I received as a Christmas gift from my parents. We got it on sale at a JoAnn (I think) and it has been a great machine. In all this time I have gotten it repaired only once (I think the timing was off?) and I am not the most attentive owner; I've been getting better about switching my needles, but I'm not great about dusting/oiling. All in all, it's been lovely. 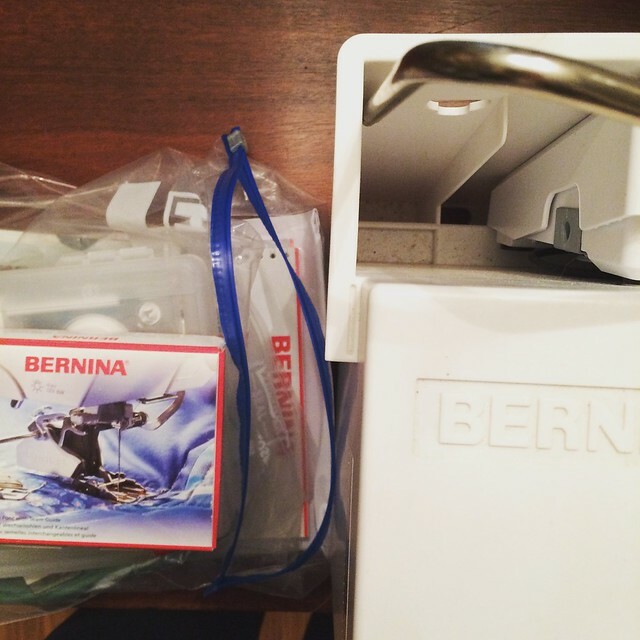 But when a brand new Bernina shows up at a bargain sale for $40, you haaaave to buy it. I recently joined the Junior League and my league hosts a bargain sale once a year, with most of the items for sale donated by members and their families. I volunteered to help set up the morning of the event, and spent hours and hours sorting clothes and all sorts of other stuff. I was in the middle of folding tee shirts when, above the din, I heard someone say "sewing machine." Naturally I popped right out of my tee shirt burrow like a groundhog and skittered over to check it out. Imagine my surprise when it wasn't a cheapy beginner straight stitcher, but a brand new, never-been-used, still-has-all-the-manuals Bernina 153 (Quilter's Edition). Whaaaaat? And they were pricing it at $40. I had to have it. I mean, it had a walking foot still in the box. I told the other ladies working that it was miiine, i neeeded it, could i buy it pre-sale??? and the answer was no. They did not seem to think I should be concerned about missing it, that "there would not be a run on sewing machines!" Ha! I resolved to purchase it as soon as the sale opened at five, but I was nervous alllll afternoon, thinking someone would get it before me. Needless to say, I showed up early to the sale, marched straight to my new machine, and snatched it up. I was at the checkout by 5:02, and had a sewing machine in my trunk at 5:03, out $40 but smiling (and, in fact, feeling pretty smug). I have a lot to learn--it has a front loaded bobbin which I have no clue how to use--so I'm happy to have the manual. And, of course, the internet. But it was threaded when I bought it, and it is so zippy! Faster than my Singer, and quieter too. I can't wait to do some sewing! Welcome to the family, little Bernina! ps: what sewing machine do you use? if you have more than one, do you have a "backup" or do you use them all for different things? Wow, $2000! I just read that it is not supposed to be oiled, so you're right. I'm excited to start learning the ins and out of this machine! You really do need to oil the bobbin area of your Bernina!! It is metal on metal and will thank you so much if you oil the hook race. It will also be sooo much quieter! Awesome! I have 2 machines I regularly use, a Singer 160 for my regular sewing and a Janome (with a walking foot) that I got for my 12th birthday which I use for particularly thick or slippery/difficult fabrics. I also have about 5 vintage machines..... Plus my overlocker of course! Wow - steal of the century! Good for you! I've got a new Bernina 350 and love it. I used my Mom's old (1970s) Bernette 440 for years, but passed that on to my sister when I got my new one. And yes, the Bernina is really powerful! I accidentally sewed through my finger when I was first learning to use it. Yikes! Wow, this is incredible. I'm so jealous! I'm becoming increasingly aware of how little my machine can do and have to start saving for a new one! Have fun with it! I always thought my little Singer could do everything, but playing around with this one, it just seems much sturdier, and it can go through many more layers. Hopefully you'll find a deal as well! also concerning the bobbin case -no problem - when inserting make sure you are going clockwise with the thread and when you bring it up and forward you will make 3 clicks and then you are ready to go. I also just found a trick about holding the bobbin case by the thread to see if you have the tension correct (mine was way to loose so I had to tighten the screw on it) learned this from Colette tips that they email to you on Tuesdays! Good luck! Thanks! I've been watching some youtube videos and getting a bit quicker at it but it's a lot trickier than the drop-in kind I think. What a find! I don't blame you for feeling smug, I would do too if I'd picked up a Bernina for $40. I currently use a Janome and have no complaints, although after studying tailoring this year and using industrial machines I wish it was faster! One day, if I have the space, I'll get an industrial one. I also have a 1970s Singer which I picked up on ebay, it sews pretty quick but I need to get it serviced and repaired. Have fun with your new machine. I would be so terrified to use an industrial machine but I'm sure you acclimate quickly. I'd be afraid of sewing through my fingers or something! What a steal! Congrats! I sew on a Bernina and I love it. I have my old Singer as backup. That's my plan as well, I have stuck the Singer in its case in the closet but it's nice to have two and use one as a backup or switching between thread colors. Congratulations on a great buy! I was just given one but unfortunately it came without a manual or much in the way of accessories. It is extremely difficult to locate a copy of the manual. Any chance you would be willing to scan the manual and send it to me for a reasonable fee?